Albert Einstein once said that innovation is not the product of logical thought. And to think: The Nobel Prize winner never fumbled his way through a game of "Madden 06" with the passing cone turned on. From novel features to shifting controls, sports games are forever attempting to innovate -- the better to convince you that last year's edition is more outdated than rotary telephones, and that this year's iteration is as essential as oxygen. Sometimes these changes make all the difference. Sometimes they make E.T. on the Atari 2600 look inspired. Well, almost. Philadelphia QB No. 12 gets crushed. A siren wails. A pixelated red-and-white ambulance rolls onto the field, running over teammates and opponents alike to reach the fallen signal-caller. 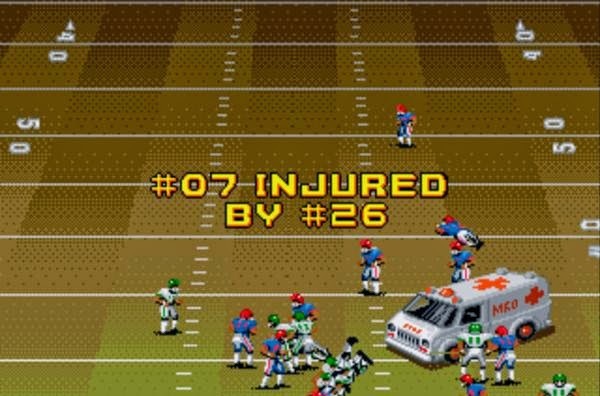 "Madden 92" may not have been the first sports simulation to feature injuries, but it probably was the first one that made gamers look forward to them. Beyond provoking giggles, the Madden ambulance taught a generation of players a harsh, almost existential lesson about the fragile nature of real-world quarterbacks: They go down and go down hard. And by plowing through other players like traffic cones, the ambulance slyly mocked our star-obsessed culture a decade before the "Grand Theft Auto" series took a blowtorch to all things American and dumb. Besides, without "Madden's" inspiration, would the makers of the subsequent "NHLPA Hockey '93" ever have let us made Gretzky's head bleed? What's the only thing better than crushing Doug Gilmour at center ice, stealing the puck from his prone, splayed body, then using Jeremy Roenick to score the game-winning goal for eternal dorm bragging rights and/or beer money? Try replaying that goal, over and over, triggering the goal siren each and every time, until the whining, high-pitched squeal drives your furious roommate into the hallway, beaten and broken. Played among friends, sports games are all about indulging our inner Belichicks -- running up the score, never punting, going for two and calling time out with five seconds left to take one more shot at the end zone, just because 50 is a nice, round number. Instant replay lets you rub it in, show your friends just how badly you clowned them, all in Zapruder-style super slo-mo. Hit pause and taunt away. The Mongol general from "Conan the Barbarian" would approve. And always remember: End up on the wrong end of a replay and there's no better tool to demonstrate how the CPU cheated you out of an obvious touchdown catch. Yet again. an overflowing slop bucket of absolute fail. Peyton Manning moves and throws just like Donovan McNabb. Allen Iverson and Yao Ming have the same crossover dribble. Enter recent iterations of the "NBA 2K" series in which "signature style" animations help make individual players look and feel unique. Shawn Marion's funky-flip jumper is as ugly as the genuine article, requiring different button touch than Kobe Bryant's smooth fadeaway. Zydrunas Ilgauskas can't mimic LeBron James' high-flying dunks. Even Chris Paul and Deron Williams don't handle the ball the same way. "All-Pro Football 2K8" sported a similar system, with Joe Montana's passes (smooth, super accurate) having little in common with those from Dan Marino (quick release, bullet zip), and even less with Andre Ware's wounded ducks (self-explanatory). Through attention to realistic detail that actually impacts game play -- as opposed to gee-whiz fluff such as getting football helmet warning labels just right -- signature style helps bridge the gap between flesh-and-blood jocks and their digital doppelgangers. Here's hoping other sports games follow suit. Or at least keep Tony Parker from jamming home alley-oops the way Vince Carter does. A long-forgotten feature from "Mutant League Football" on the Sega Genesis -- what, you were thinking "NBA Live 07"? -- bribing the ref worked exactly like it sounds: Once per half, gamers could pay off the game official, who then would call bogus penalties on the other squad. Of course, the opposing team subsequently could call an audible to murder the dirty ref, good for a 5-yard penalty. Which, come to think of it, seems a little excessive. Snap the ball. Drop back. Up come three boxes at the top of the screen, each featuring a receiver and corresponding to a control pad button. Receiver in box "A" look open? Throw him the ball by pressing A.
Voila! Simple as that. So why did it take so long for football game developers to figure out? Before the introduction of passing windows in the very first "Madden" for the Sega Genesis, playing virtual quarterback was about as intuitive as stepping under center for an actual team while wearing a LEAF #16 jersey. Point-and-pass systems were crude and inaccurate. "Tecmo Bowl" -- a game otherwise lauded for ease of play -- forced players to go through a cumbersome, top-of-the-screen-to-bottom pass progression. The worst offender? Think back to "John Elway's Quarterback," which featured the following Rube Goldberg-shaming setup: (a) move twitchy, on-screen passing cursor controlled by spring-loaded second joystick toward open receiver; (b) press pass button while holding spring-loaded joystick steady; (c) hope receiver catches ball thrown in general vicinity; (d) get sacked repeatedly while fumbling through steps (a), (b) and (c). A revelation at the time, "Madden's" windows live on through the icon-based passing systems found in just about every current sports game, proving that a thing of beauty truly is a joy forever. Or at least until we get virtual-reality helmets to go with our Wiimotes. Speaking of the Wiimote: Have you ever held one? Played Wii Sports? Do you want to smash a home run, drive a golf ball, throw a jab, swing a racket or toss a strike by hitting a stupid colored button ever again? No? Our point exactly. Anything that can make stale sports gaming franchises like "Pro Evolution Soccer" feel fresh deserves praise, and anything that can make virtual bowling more addictive than a heroin drip isn't just innovative -- it's downright scary. In a good way. Farewell, old-school game pads: Not since Lawrence Taylor turned Joe Theismann's leg into a masterwork of nonrepresentational modern art has something sports-related been rendered so instantly obsolete. Oh, and don't get us started on the Wii Fit balance board. Admit it: Sports games are masturbatory by nature, solo exercises in fantasy wish fulfillment. (Insert joystick joke here.) Play quarterback for the New York Giants. Block Dwight Howard's shot. Rip a return winner off Andy Roddick. Skate like Tony Hawk. "Madden" and its ilk allow us to play-act mighty athletic feats we couldn't dream of pulling off in real life, all from the comfort of our living rooms. And since we're already playing with ourselves, why not literally play with ourselves? Create-a-player lets you make a decent digital approximation of yourself, your friends, your old high school teammates, Michael Jackson -- OK, maybe that's just us -- then lay a whuppin' on the '85 Chicago Bears. Trust us: If you haven't dunked on Shaquille O'Neal's head with a 5-foot-7 digital version of yourself, you haven't really lived. Create-a-player also deserves kudos for permitting you to conjure up the scrubs often left off in-game rosters -- how dare 2K Sports forget to include Roger Mason Jr. -- as well as incoming draft picks, the better to play with while anxiously awaiting next year's roster update game. As for the gamers who just have to re-create Michael Jordan's Chicago Bulls, year after year? They're covered, too. In sports gaming, it's always 1998 somewhere. -- right down to the bullpen cart rides for the relief pitchers (which also appeared on your friendly neighborhood JumboTron). Sure, he landed Randy Moss for two magic beans on the dollar. And yes, he's the architect behind pro football's only current dynasty. But so what? You could do a better job than New England Patriots vice president of player personnel Scott Pioli. And you know this because your Patriots squad features a backfield of LaDainian Tomlinson and Adrian Peterson, with Terrell Owens bookending Moss. Ah, the joys of franchise mode -- "SimCity" for gamers who prefer draftology to urban planning, fantasy sports you can actually play, the ultimate athletic power trip. Why should Jerry Jones get to have all the player-trading, stadium-creating, popcorn-price-inflating fun? Why should UC Irvine's football team play fifth fiddle to USC? Why can't the Arizona Cardinals become the Mexico City Banditos? In franchise mode, you can remake the sports world as you see fit, even right real-life wrongs. The Chicago Bears can draft a competent quarterback. The Phoenix Suns can take back the Shaq trade. Notre Dame can win at least one BCS bowl game in a 10-year span. All things are possible -- and likely probable, assuming you turn the "CPU trade override" function off. You miss. He giggles. You shoot. He's bulletproof. If the "Duck Hunt" dog doesn't epitomize the idiosyncratic charms and quirks that make the best sports games memorable -- a bit surreal, a bit fantastical, and ultimately, more than a bit fun -- then we don't know what does. Interested in pursuing the people's business? Forget Spygate. Do something about sports game unlockables, an abomination before God and man -- or, in this case, "Tecmo Bowl" Bo Jackson and man. Imagine this: You go to an electronics store. Buy a television. Go home. Plug it in. Press power. Turn on ESPN. Up comes a message:bYou must watch 50 hours of Food Network to unlock this channel. You promptly return the TV -- right through the storefront window. So are unlockables. Look, games are expensive. Life is short. Humans weren't meant to log more play hours than the dudes on "Madden Nation" in order to use Barry Sanders; no one, not even Guantanamo detainees, should have to win 10 races in a Honda Civic just to get a sniff of a hot Euro supercar. Heck, we drive a Honda Civic every day. "Gran Turismo" is our one fleeting chance to grab the wheel of something better. AND WE ALREADY PAID FOR THE STUPID GAME ANYWAY. So hold a news conference. Schedule some hearings. Call Mario, Sonic and "Madden" cover boy Brett Favre as witnesses. Federally mandate that any and all unlockables be: (a) obtainable through inputting the Contra code; (b) otherwise illegal. Hey, we know deep down that video games are little more than Skinnerian conditioning exercises -- press button, get reward -- but that doesn't mean they should remind us of the fact. More than a decade ago, "Joe Montana Sports Talk Football" introduced a crude play-by-play announcer, an innovation so grand, so breathtaking, so epochally sweet that they named the freaking game for it. Which, in retrospect, was dumb. Montana himself went on to a short-lived, uninspired broadcast career; sports game play-by-play hasn't fared much better. And that's without mentioning Pat Summerall's so-bad-it's-brilliant contributions to "Madden." On one hand, today's DVD-based sports titles have larger, more varied vocabularies than their primitive, cartridge-based predecessors. On the other hand, that's not a good thing. From flat deliveries to inappropriate excitement, from repetitive one-liners to calls that simply make no sense, sports game commentary remains the most compelling argument for the mute button this side of Glenn Beck. Game makers ought to make every title speak with the voice of HAL 9000 -- Dave, are you sure you want to go for it on fourth-and-30? I honestly think you ought to sit down calmly, take a stress pill, and think things over -- or just scrap the feature altogether. Oops. That was Fox Sports' contribution to real-life NHL broadcasts. Our mistake. What do digital pigskin and Green Day have in common? Your guess is as good as ours. It's bad enough that sports games are increasingly suffused with corporate advertising. Must our ears be assailed by some record company's multi-platform marketing strategy, too? Adding insult to aural injury, "Madden" already features the only licensed music any football game ever needs: authentic NFL Films songs, including "A Golden Boy Again" and the inarguably transcendent "The Autumn Wind." Too bad you have to turn off Yellowcard and Sum 41 to actually hear them. Competition fosters innovation. Survival of the fittest. Evolve or perish. Monopolies, by contrast, encourage stagnation and complacency. Is it any wonder that the "MLB 2K" series has gone downhill since 2K Sports acquired an exclusive major league license? Or that NFL rights holder "Madden" is just now getting around to incorporating game-play concepts -- such as realistic gang-tackling -- found in "ESPN NFL 2K5," a 4-year-old football sim? And speaking of "NFL 2K5": widely regarded as one of the best pigskin games ever, it retailed for 20 bucks, forced EA Sports to temporarily cut the price of "Madden" and ultimately prompted the company to offer the NFL a "Godfather"-style deal, an exclusive pact that all but eliminated other football titles. Good for EA shareholders. Bad for consumers. The wonder isn't that the "Halo"/"Half-Life"/"Doom"-inspired first-person football mode in "ESPN NFL" sucked. It's that it didn't create a black hole large enough to swallow the entire planet. We can almost forgive the concept -- Hey, let's make a football sim that looks and plays like those Shooter McMurder games the kids love! But the execution? No chance. Lose your peripheral vision, duct-tape your eyelids, wave a magic wand that transforms everything more than 5 yards away from you into a foggy, low-res blob. Now find the open man before you get sacked. Sound like fun? First-person football carries the flag for every looked-better-on-paper feature that should have been junked in the prototype stage. After all, football games use a God's-eye view for the same reason networks don't broadcast from sidelines -- the sport is infinitely more entertaining when you can actually see what's happening. "Just as a liquid, such as water, flows when it hits a surface to fill open space and gaps, Liquid AI enables the video football players in 'Madden NFL 98' to dynamically flow and move to the correct positions on the field in order to make a play." Er, right. So says the official statement from Mr. Miyagi EA Sports news release for "Madden 98," a game that really did "react exactly as a human would" -- provided said human had just received a prefrontal lobotomy. A stand-in for every bogus back-of-the-box marketing bullet point passed off as an innovative new feature, Liquid AI did not put an end to ridiculously easy long bombs, unstoppable money plays or a dozen other ongoing football game CPU foibles. It did, however, inspire one of the cattiest quotes in sports game development history: Asked about "Madden," Sony producer and EA Sports rival Kelly Flock told a gaming magazine that "Liquid AI is the crap that ran down [EA's] leg when they saw [Sony's] 'NFL GameDay.'" Snaps! Pretty funny Tracy Morgan-Ben Wallace commercial. Utterly horrific attempt to make one-on-one dribbling in the "NBA 2K" series akin to the button-stabbing, joystick-tapping finger-jujitsu found in "Virtua Fighter." A classic example of sports gaming complexity creep -- also see "Madden's" passing vision cone -- Isomotion took a simple, intuitive one-button dribbling system that wasn't broken (tap for a crossover, tap while holding turbo for a spin) and fixed it into something nigh unplayable, a clumsy mashup of right analog stick movements and lengthy, random-seeming player animations. Four years and a dozen tweaks later, 2K Sports finally scrapped Isomotion and returned to a variation of its previous dribble-move method in the well-reviewed "College Hoops 2K8," a tacit admission that it had it right the first time. Create-a-fan is "Madden 05's" best-in-class contribution to the long list of unwanted, unneeded sports game features that sap precious development resources from more important things -- such as programming a decent dropback animation. Not to put too fine a point on it, but if you have time to create a virtual Washington Redskins fan -- complete with a Hogette pig nose and a turkey drumstick -- you may want to consider an alternate direction in life. One involving bathtubs and toasters. game engines -- more than the inexplicable emphasis on painstakingly modeled perspiration. Never mind that "NBA 2K6's" players looked like glazed doughnuts, or that "NBA Live 06's" players appeared to be running a marathon during a monsoon. Just look at their jerseys -- they're wet, too! What more could a gamer ask for?